Easter - Saving the world from bad baking. 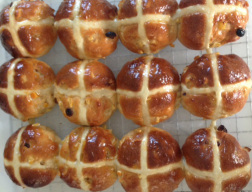 Those spicy sweet buns are a real treat not only on Good Friday but already a few weeks before then. Made with sultanas and mixed peel, and spiced with cinnamon, cardamon, ginger and nutmeg, they are an absolute delight. Order a half a dozen now. Or better a whole dozen!Just email Brigit. 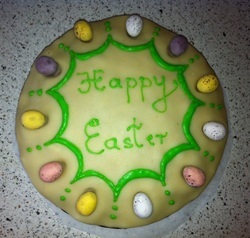 A Simnel Cake is a light fruit cake with marzipan and a delicious, traditional English Easter Treat. The 11 mini eggs represent the 12 Apostels (minus Judas). Order one now! Just email Brigit.